With the race to the 2019 elections drawing closer, SABC Digital News is talking a look back at some moments from 25 years ago, when South Africa approached its first democratic election. Gay McDougall was one of five International Observers tasked with monitoring the election process in 1994. She is also famously photographed alongside President Nelson Mandela as he cast his vote. McDougall passionately writes about the sentiment of that historic moment. 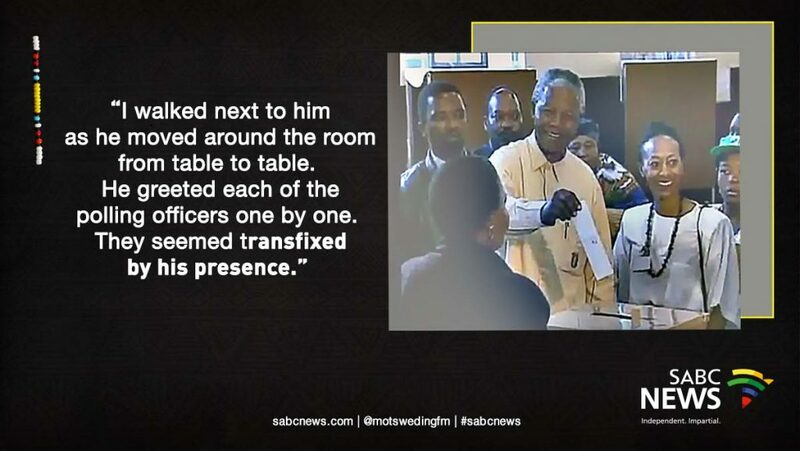 The polling station was a one-room school house on the outskirts of Durban that had historical significance for Mandela’s African National Congress (ANC). The student desks and chairs had been removed for that day and instead there were several long tables (around 5ft long, about 1.5m) arranged along the sides of the room with two or three people sitting behind each. These were the polling officers who had been trained to perform the necessary functions at the polls – we (the Electoral Commission) trained thousands of ordinary Black South Africans across the country to staff the polling places; to give out the ballots, help the millions of first time voters and to count the ballots when the polls closed. Also in the room were two large boxes for completed ballots, one for the election of members of the new non-racial national parliament and one for the election of members to the new provincial parliament. I walked next to him as he moved around the room from table to table. He greeted each of the polling officers one by one. They seemed transfixed by his presence. He listened intently to each as they gave instructions for how to mark his ballot and deposit it into the ballot box. As we were about to emerge from the school house, he noticed a woman hiding behind the door as if she was not supposed to be there – as if she just had to sneak in to catch a glimpse of this historic moment. She seemed to be an elderly person; she had very dark skin that looked weathered and wrinkled. Her clothes gave the impression that she was poor but proud. Her hair was covered in a kerchief. She leaned on a tall stick for balance. Madiba stopped and took her hand and greeted her in what I assumed was a language they shared. It was a moment of tremendous generosity and shared pride about what they had accomplished; what they had suffered. The door opened and we walked out into the brilliant sunshine flooding onto the school house porch. On the lawn in front of us were hundreds of reporters from around the world. The sound of camera shutters was unbelievably loud. After a quick staged photo-op of Mandela voting, he moved to the microphone to speak. It was a transcendent moment – first and foremost for all of the people of SA, the many years of struggle, all the suffering, all the violence and uncertainty in the run-up to the elections. All of that had come down to this one moment, the beginning of a new era in SA. The fact that I was there also had meaning in a larger sense. Here was an African American woman, born in the era of Jim Crow rule in the South of the US; matured through the years of the civil rights struggles in the US and our own version of transformation. I think that had meaning. Also, I would hope that my presence there may have symbolised the important role that the international community played in the movement against apartheid, and how crucial it was that Americans said no to our own government when under the leadership of Ronald Reagan it wanted to further solidify its support of apartheid – we said no to that, and yes, that we must have sanctions instead. I had played a central and active role in making that happen in the US. I was one of the small group of activists in Washington, DC that devised and carried out the plan to have sit-ins at the South African Embassy every day for a year in 1984 which turned into a national high-visibility movement. The public pressure created by that gave birth to sanctions. But my presence in South Africa and as member of the Independent Electoral Commission was a consequence of the work that I did for the 14 years prior to those pivotal elections. During those years I was Executive Director of the Southern Africa Project of the Lawyers Committee for Civil Rights Under Law and I was involved in virtually every major political trial that took place in South Africa and Namibia. I raised millions of dollars from the international community that I funneled into South Africa to pay the lawyers’ fees. Working with lawyers inside the country who were willing to take the risk, we got literally thousands of detainees and prisoners out of jail. Through that activity I developed relationships with most of the liberation activists inside South Africa and those who were in exile. So, when the time came, I was appointed to be one of the 5 non-South Africans members on the IEC. At that incredible moment, however, standing next to Mandela when he cast his vote, I think I was on auto-drive. As a member of the IEC, I had been up all night for the previous several days. There were so many crises – we thought we would not be able to pull it off. But that morning, the sun came up and we saw the long, long lines of people, ready to wait for even more hours if necessary – after all, they had waited for so many decades already. Watch: a look at the events of 27 April 1994…. Gay McDougall is an American human rights lawyer. She is currently Vice Chair for the UN Committee on the Elimination of Racial Discrimination, and once served as an International Observer for the IEC during the 1994 South African elections. The post The sun came up… memories of April 27, 1994 appeared first on SABC News – Breaking news, special reports, world, business, sport coverage of all South African current events. Africa's news leader..